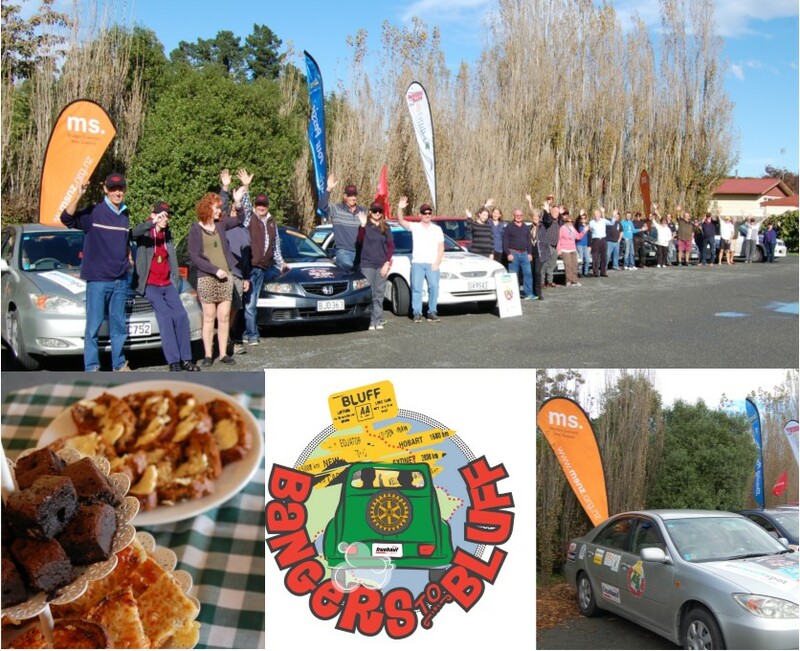 The Rotary Club of Half Moon Bay, in Auckland, recently traversed the country making make the long journey to Bluff in their annual fundraiser ‘Bangers to Bluff’. Every year competitors buy ‘Bangers’ (cheap cars under $2000) and drive on ‘roads less travelled’ from Auckland all the way to Bluff, over an 11 day period. After the last photo stop in Bluff the cars will be sold off at an auction to help raise funds for their chosen charities. The cars certainly are ‘bangers’, ranging from an Audi with very broken suspension to a Toyota with a range of horn sounds that delighted the children. This year, MSNZ and Hopeworks NZ (who provide support to people with head injuries) are fortunate to be the chosen charities and MSNZ were delighted to have an opportunity to meet the full crew in person. The strong community spirit from the Kirwee residents, Multiple Sclerosis NZ and staff and members of the local MS and Parkinson’s Society of Canterbury, made the Bangers crew feel genuinely welcome and appreciated for what they are doing. The morning tea wasn’t about fundraising for clubs or charities it was about expressing our gratitude for everything they are doing for people with MS and neurological conditions, with some true Kiwi hospitality mixed in. After a couple of hours and multiple plates of cheese toasties, the Bangers left Kirwee with blasts of their horns and headed off to the next stop on their trip, a photo at the Springfield donut. For more information on the event or to donate click here and for a recent press article click here.